While on our trip to Ottawa, the Canadian capitol city, with Guillaume Le Floch, the French exchange student, we wanted to get to the National War Museum. We could not find the way, so Nikhil and Guillaume approached two police officers to find the way. 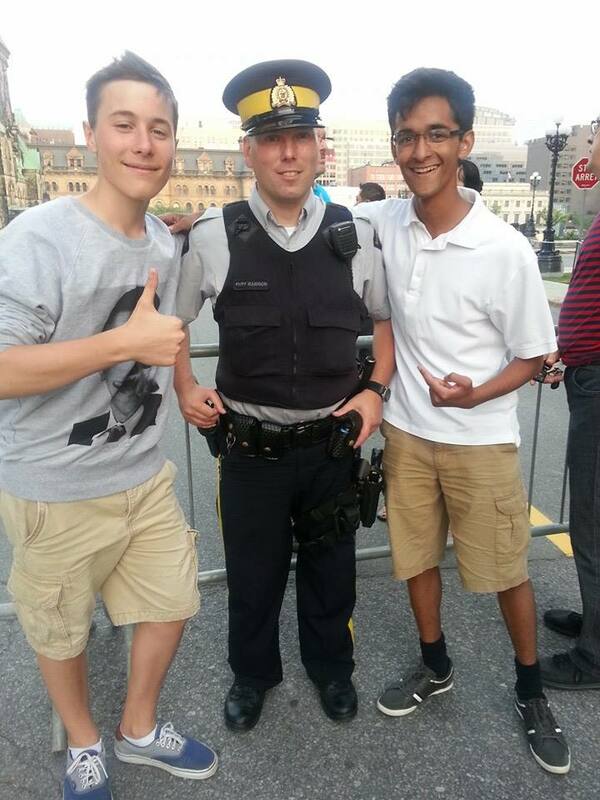 A chat ensued between the police officers and the two teens and they ended up snapping photos with them. A few days later, on a long drive to see the native aboriginal village, we wanted to stop at a coffee shop for a break. We did not spot one for a long time and hence I decided to pull off the road and search for one on the GPS. A police cruiser pulled up behind our car and an officer came to ask whether we needed any assistance. I rather sheepishly said that we were looking for a coffee shop to which the officer said that GPS will not help you as an outlet of Tim Hortons has recently been opened and to reach there he advised us to turn back, drive 500 meters and turn right at the intersection. We thanked him and drove to the coffee shop for a much deserved break. During the coffee break Guillaume said that he would never have asked a police officer in France for such an assistance. The modern police institution in France has remained an instrument of state, regardless of who happens to hold state power. During the Second World War (1940-45), when France was occupied by Germany, the police became an instrument of suppression by the occupier. French police, from the time of the French Revolution to date have been used for handling various demonstrations by public and hence have an image of being unfriendly to the citizens. This has created a gap between the police and the people, especially the youth in France. The first Canadian police officers recorded in the history books worked in Quebec City in 1651 and their duty was to act as night watchmen for the community. Today, policing in Canada is carried out at three levels: federal, provincial and municipal. The Royal Canadian Mounted Police (RCMP) operate at the federal level in all provinces and territories. At the provincial level, the Ontario Provincial Police, the Quebec Police and the Newfoundland Constabulary operate as provincial police services. Crime control and order maintenance are the primary police in which crime control activities occupy less than 25% of police time. Community-based policing has gone a long way ahead in Canada and it involves a full partnership between the community and its police in identifying and reducing local crime. Crime prevention is the joint task of both the community and the police, and this joint effort is carried out within an interactive, cooperative and reciprocal relationship. The increasingly multicultural nature of Canadian society is having an impact on Canadian policing. Complaints about the police by members of ethno-cultural and visible minorities include over- policing of their communities, random stops and searches, discrimination in the use of police power, ‘blaming the victim’ when the victim is a member of a minority group and underrepresentation of minorities within police organizations. The governments at all levels have taken many initiatives that address police-minority relations. One such initiative is the Youth Education Bureau of the police that works in partnership with the Health Department and the School Boards to create a positive and safe learning environment within the school system. The Officers of the Youth Education Bureau are responsible for initiating the SAFE (Schools Against Fearful Environments) programs to their individual schools. In this programme, the staff, parents and the police work together to ensure a safe environment at school and in the community. The programme ensures that the students are given a voice in their school. Any concerns raised is worked on through a focused plan of action. Each officer is assigned approximately 30 schools and they deliver various presentations and participate in special events hosted by their schools. Project RAID (Reduce Abuse in Drugs), is a seven-part drug education and awareness program delivered by a team of dedicated officers at all middle and high schools. The police have established a Children’s Safety Village, which receives students on a fun educational trip in grades 1 to 5 to educate the students on road and personal safety. The officers visit various schools and interact with the students. For Grades 1 and 2 they cover, bullying, street proofing/ pedestrian safety and stranger awareness. For Grades 3, internet security is added to the above list. For Grades 4 and 5, introduction to drugs and tobacco is also added. For Grades 6, 7 and 8, drug abuse prevention, youth crime, youth gangs are in addition to the above. In addition the Neighbourhood Policing Officers work with the area high schools to maintain a presence with our youth population. They work directly with teachers, parents and the community to ensure that the youth are on the right path to a great future. There is a system of Co-op placements with the police for students of Grade 12 as well as those in college or university. Co-op placements follow school semesters and are available for 15 weeks. To be eligible for the co-op placement program, students must be attending college or university and be enrolled in a co-op or work term program at their institution of learning. Police and the Canadian Forces through Army Cadet Movement are long-time partners in developing the youth through the Cadet Organization Police School (COPS). The mandate of this programme is to develop youth into leaders within the community. Many of these graduates have progressed to become active members of the Police, while others have succeeded in different areas of the community. The interactions between students and the police has ensured that there exists a warm, welcoming and community-oriented relationship between the citizens and the police. The confidence built up through these programmes have ensured a high level of confidence in the police. It is not uncommon for people of all ages to seek police assistance in any eventuality, at times for routine route directions or even a help to change a flat tyre. This is what every citizen of any country wants their police to be.